Ocean's Twelve is a 2004 American comedy heist film, the first sequel to 2001's Ocean's Eleven. Like its predecessor, which was a remake of the 1960 heist film Ocean's 11, the film was directed by Steven Soderbergh and used an ensemble cast. It was released in the United States on December 10, 2004. A third film, Ocean's Thirteen, was released on June 8, 2007, in the United States—thus forming the Ocean's Trilogy. The film stars George Clooney, Brad Pitt, Matt Damon, Catherine Zeta-Jones, Andy García, Julia Roberts, Don Cheadle, Bernie Mac. It was the tenth-highest-grossing film of 2004. Terry Benedict (Andy García) locates all eleven members of Danny Ocean's (George Clooney) gang, demanding they return the $150 million they stole from his casinos plus $38 million interest. Short by half, the group schemes to stage another heist in Europe to avoid problems with United States authorities. They are tipped off by an informant named Matsui (Robbie Coltrane) about the location of the first stock certificate ever. After a complex series of schemes they find the document has already been stolen by "The Night Fox", another master thief. Europol Detective Isabel Lahiri (Catherine Zeta-Jones) is called in to investigate the theft and realizes that her talking earlier about a particular burglary with Rusty (Brad Pitt) during their relationship, would have given Rusty the idea of how to solve the complication the gang would have come up against. Surprising the group at their accommodation, she warns them they cannot beat the Night Fox or his mentor, the mysterious master-thief "LeMarc", both of whom excel in practicing the "long-con". She has been hunting both for years. Danny and his gang discover the Night Fox is Baron François Toulour (Vincent Cassel), a wealthy baron who has a mansion on Lake Como. Toulour invites Danny to his mansion and reveals that he had hired Matsui to inform the gang about the certificate in order to arrange the meeting with Danny. Toulour is upset that LeMarc did not describe him as the best thief in the world, and challenges Danny to steal the Fabergé Imperial Coronation Egg. If Danny and his gang win, Toulour will pay off the debt to Benedict. Danny and his gang begin to plan an elaborate heist to swap the egg for a holographic recreation, but the engineer hired by the group accidentally tips off Lahiri to their presence, and she captures most of the gang on their first attempt. Linus (Matt Damon) comes up with a second plan involving Danny's wife Tess (Julia Roberts) posing as a pregnant Julia Roberts in order to get close to the Egg and swap it. They are foiled by Lahiri and a coincidentally present Bruce Willis, and the rest of the group are captured. Lahiri is told that they are to be extradited to the United States. Linus is chosen first to be interrogated by the FBI agent (Cherry Jones) assigned to collect them. It turns out that she is his mother, who organises the release of the whole gang. She points out to Lahiri that she will face only retribution for her forging a signature on a Europol form to obtain the necessary arrest warrants for Ocean's gang. Some time later, Danny and Tess return to Toulour's estate where he reveals his glee at their failure. Toulour claims to have stolen the egg at night using his agility and Capoeira skills to evade the heavy security. Toulour's celebration is short-lived when Danny reveals that his group stole the egg while it was in transit to the museum and Toulour realizes they were tipped off by LeMarc. A flashback reveals that Danny and Rusty had met LeMarc earlier when he revealed his confidence trick intended to humiliate Toulour, and at the same time, to restore to himself the Fabergé egg that he had stolen years ago and had returned following his wife's wishes. Toulour is forced to admit Danny won the bet and gives him the money for the debt. They pay back Benedict and promise not to perform any more heists in his casinos—even as Toulour himself is in the background spying on Benedict. Rusty takes Lahiri to a safe house that he claims has been lent to him by LeMarc. She is reunited with her father, who is revealed to be the man she has been pursuing for years: LeMarc (Albert Finney). The final scenes of the film, in which the primary characters enjoy a private poker session, imply that she and Rusty have re-kindled their relationship. The script was reworked when Julia Roberts learned she was pregnant with twins. The film was shot in 2004 in Atlantic City, New Jersey, St. Petersburg, Florida and in Las Vegas at the Bellagio Hotel. Filming also took place in Chicago, Amsterdam, Paris, Monte Carlo, Lake Como (at George Clooney's Villa in Laglio), Rome and Castellammare del Golfo in Sicily. The production spent three weeks in the Netherlands; scenes were filmed in the KattenKabinet, the Hotel Pulitzer, Haarlem railway station, and The Hague City Hall. In Paris, scenes were shot at the Sorbonne, the Australian Embassy, and the Gare du Nord. Afterwards, filming moved to Italy. The Casino Monte Carlo and the Villa Erba also served as filming locations. Ocean's Twelve received mixed reviews overall, scoring a 55% on Rotten Tomatoes. The film was criticized for its slow start, its complex plot and a final twist that negated much of the preceding action. The Washington Post's Stephen Hunter said that "it all ends on one of those infuriatingly sloppy notes where, having dramatized narrative events WXYZ for us, which we have taken on good faith, it suddenly and arbitrarily delivers narrative events STUV, which completely invalidate events WXYZ." Newsweek said that "while it looks like the cast is having a blast and a half, the studied hipness can get so pleased with itself it borders on the smug." Claudia Puig with USA Today remarked, "At the rate things are going, all of Hollywood will put in about a day's work on Ocean's Seventeen." More positively, Roger Ebert concluded his review this way: "The movie is all about behavior, dialogue, star power and wiseass in-jokes. I really sort of liked it." Ocean's Twelve was rated by Entertainment Weekly as one of "The 25 Worst Sequels Ever Made". Steven Soderbergh, however, has stated that it is his favourite of the three Ocean's films. 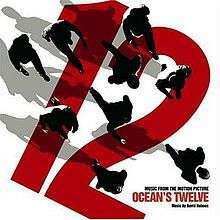 The original soundtrack to Ocean's Twelve was released by Warner Bros. Records on December 7, 2004. David Holmes returned to compose the music for the film and won a BMI award. His songs "Amsterdam" and "I Love Art...Really!" were released as singles and do not appear on the commercial soundtrack. The soundtrack is also absent of the music used during the Nightfox "laser-dance" sequence in the film. The clip is from a track called "Thé à la Menthe" performed by La Caution, according to the film's end credits. The track titled "The Real Story" is different on the commercial soundtrack than it is in the film, which uses "Rito a Los Angeles" by Peppino de Luca, featuring part of the main riff of In-A-Gadda-Da-Vida. The music Benedict plays on the piano when he comes to visit Basher is called "Requiem for a Dead". It was written and performed by Andy García. The track that plays as the group are escorted from the police station to the black cars is "Margaret" by Giuseppe De Luca. The track that plays as Lahiri cracks Matsui is "El Capitalismo Foraneo" by Gotan Project. "Ascension to Virginity" was taken from the 1968 movie Candy where it likewise appeared in the epilogue—the version on the soundtrack is the full length version from the Candy soundtrack LP. ↑ "OCEANS 12 - Production notes - Twelve Is The New Eleven". CinemaReview.com. Retrieved December 1, 2013. ↑ "OCEANS 12 - Production notes - About the production". CinemaReview.com. Retrieved December 1, 2013. ↑ Stephen Hunter (December 10, 2004). "An Uneven 'Twelve'". The Washington Post. Retrieved May 20, 2010. ↑ Puig, Claudia (2004). "Forecast for 'Ocean's': Splashy and very cool"
↑ Ebert, Roger (2004). "Ocean's Twelve" Chicago Sun-Times. Retrieved August 3, 2007. ↑ "The worst movie sequels ever - # 16. Ocean's Twelve". Entertainment Weekly. Retrieved 2008-09-07. ↑ Nissim, Mayer (16 November 2009). "Steven Soderbergh defends 'Ocean's Twelve'". Digital Spy. Retrieved 10 June 2013.